Motul Motor Oil - 4100 Power 15W-50 - Brakeswap.com - Friction for the Win! Synthetic blend (Technosynthese®) lubricant specially designed for high performance cars powered by large displacement engines, turbo Diesel, direct injection or Gasoline engines with injection and catalytic converter. 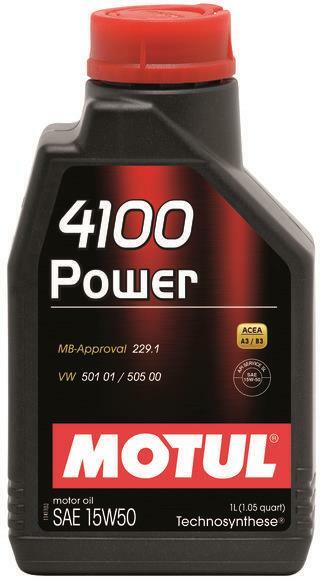 Suitable for all types of Gasoline or Diesel engines using leaded or unleaded gasoline, diesel fuel or LPG. High viscosity at high temperature (SAE 50) for engines prone to higher oil consumption, due to high mileage.